IF YOU were looking for someone to successfully manage a promising company, it would be hard to find a candidate with a better array of credentials and know-how than Andrew Bushell. Father Andrew Bushell, the founder of Marblehead Salt Co. and Marblehead Brewing Co., and his dog Theo. He's a natural-born entrepreneur, with wide and varied experience both in and out of the business world. He founded and successfully managed a $2.5 billion investment firm. He worked as a management consultant for McKinsey & Co. After 9/11, he took a hiatus from the high-pressure world of finance and venture capital, immersing himself instead in the high-pressure world of war-zone journalism to cover Afghanistan and Pakistan for The Economist. 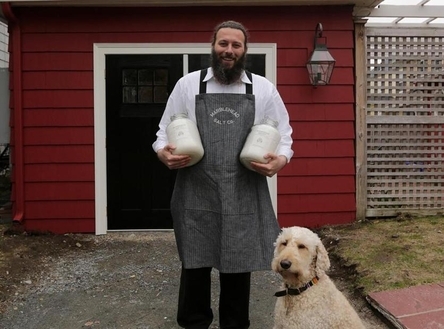 And when, after years abroad, he returned to his New England hometown, he came up with an idea for a unique local business: making and selling gourmet salt from Atlantic seawater. Like Bushell's other endeavors, the Marblehead Salt Company flourished, with annual sales growing at a 25 percent clip and the salt winning raves from foodies. So when Bushell approached the Massachusetts Development Finance Agency last year with an application for loans to grow yet another Marblehead business venture — a craft brewery and taproom — officials might have been expected to welcome him with open arms. According to MassDevelopment's website, after all, the agency was created to "help foster real estate and business projects that generate economic benefits for local communities and the state." Given Bushell's stellar track record, financing for Marblehead Brewing Co. should have been a no-brainer. The brewery applied for two loans. It intended to use the funds from one to improve its property in downtown Marblehead, and the other to purchase additional brewing equipment, in order to increase production from 700 barrels of beer in 2018 to 2,500 barrels by 2023. MassDevelopment said no. It demanded that the brewery enlist private backers who would personally guarantee the repayment of any loans. Bushell and Marblehead Brewing did so, providing the state with guarantees equal to three times the value of the loans applied for. The state demanded that the company's brewing equipment, worth $1.6 million, be put up as collateral. Bushell agreed to that too. And still the agency says no. Why? Because Bushell — more accurately, Father Andrew Bushell — is an Orthodox Christian monk. And the Commonwealth of Massachusetts is flummoxed by a loan applicant whose business chops are everything a state development agency dreams of, but whose mission and appearance are not at all what it's used to. Marblehead Brewing is a for-profit corporation. Like any other commercial brewery, it pays taxes and must keep its federal, state, and municipal licenses current. It won't survive if it can't turn a profit. But turning a profit isn't its highest purpose. Supporting the work of the church is. Marblehead Brewing is located at the Shrine of St. Nicholas, the first Orthodox Christian church in Marblehead. The church and the brewpub share the same building — the drinking establishment with its tables and tap is in the front room; the church, complete with altar and icon, is in a more private interior space — but they are separate entities, with different tax ID numbers, bank accounts, and legal profiles. The brewery is a secular, for-profit business. The church and the foundation are nonprofit religious entities that are among Marblehead Brewing's shareholders. In launching a commercial brewery to sustain the work of his church, Bushell is following the classic example of Trappist and Benedictine monks who for centuries have supported themselves through brewing and winemaking. MassDevelopment has no problem with beer companies. It has provided financing for quite a few of them, including Notch Brewing in Salem, Tree House Brewing in Charlton, and Night Shift Brewing in Everett. But a brewing company run by an Orthodox monk who wears a black cassock, lives under a vow of poverty, and has devoted his life — and exceptional business talents — to God appears to give state officials the heebie-jeebies. According to Bushell, agency officials have told him his loan will not be approved "because you're a church" and the state doesn't want to be in the position of suing a church if a loan weren't repaid. Through a spokeswoman, MassDevelopment declined to comment for this column. Rejecting Bushell's application because of his religious vocation may well be illegal under the First Amendment. It is unquestionably short-sighted. "Entrepreneurs come in many shapes and sizes, and not all fit the typical business model," says Glenn Hutchins, a tech investment superstar who is a director of the New York Fed and sits on the executive committee of the Boston Celtics. 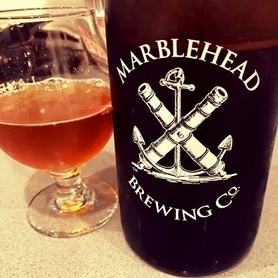 In a phone conversation the other day, Hutchins sang the praises of Bushell's beer, Marblehead Ale No. 2. He was even more enthusiastic about the monk's ability to "take a blank sheet and turn it into something impressive." To a talented financier like Hutchins, hardheaded business acumen isn't to be discounted because it serves a larger, spiritual devotion. He knows better than to judge an entrepreneur by his cassock. If only Massachusetts bureaucrats were as clear-sighted.